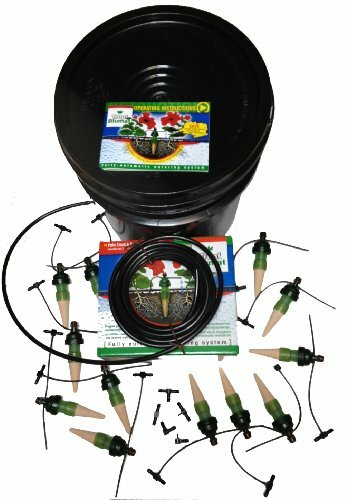 Our medium kits are designed to water areas up to 3.5 square meters, or 12 potted plants. This kit is nearly identical to our deluxe medium kit, however, it comes with a 5-gallon gravity tank with thru-hulls already installed. i.e. This kit includes everything you need to create your very own electricity-free, gravity-fed system. Blumat systems can adjust to any plant type or desired moisture level. This specific kit comes with 5" carrots, which are better for smaller potted plants (10 gallons at most). If you have large plants (10+ gallon pots), we recommend using 9" carrots, or Maxis, to get water deep into the soil. TROPF BLUMAT systems are gravity fed plant watering stakes that give each plant the individual amount of water that it needs to survive. They are adjustable and only water individual plants as they begin to dry out. MADE IN AUSTRIA with the highest grade ceramic materials available. Don't get stuck with knock offs that floods your house, we give you peace of mind. EASILY WATER a 4x8 bed or up to 12 potted plants in pots up to 12" in diameter. PRACTICAL and DEPENDABLE is why we choose Blumats. We've tried terracotta wine bottle stakes, ceramic stakes, and glass globes. They all over water, make a mess, and fail. Stick with the original, Austrian engineered Blumat Plant Watering Stake. NO WATER PUMPS are necessary for our system so your plants will get the water they need to survive during power outages and you will never have to worry about a pump failing.